The candidates comprised the most crowded field for a city post in modern memory. 1) Turnout was low, but not that low. With 98 percent of machines tallied, there were 403,000 ballots cast—meaning there could be around 410,000 when all the math is done. That equates to 8.7 percent turnout, which is not good. But it was more than the 394,000 people who voted in the 2017 primary election for public advocate, when Letitia James easily beat David Eisenbach. 2) Jumaane Williams’ victory was impressive in the context of the special election, but less so when compared to recent history. He took 134,000 ballots last night, less than half of the 300,000 votes James received in the 2017 primary election, and substantially less than the 434,000 votes Williams himself won in his 2018 primary loss for lieutenant governor. Yes, that’s comparing apples to oranges to kiwis. But down the road it might be an indicator of how Williams’ citywide appeal has evolved. At the very least, it’s worth memorizing in case it comes up in a trivia game some day. 3) There were a lot of candidates who didn’t have a lot to lose, and two who did. Eric Ulrich placed second in a crowded field—not bad for a member of the tiny Council minority. 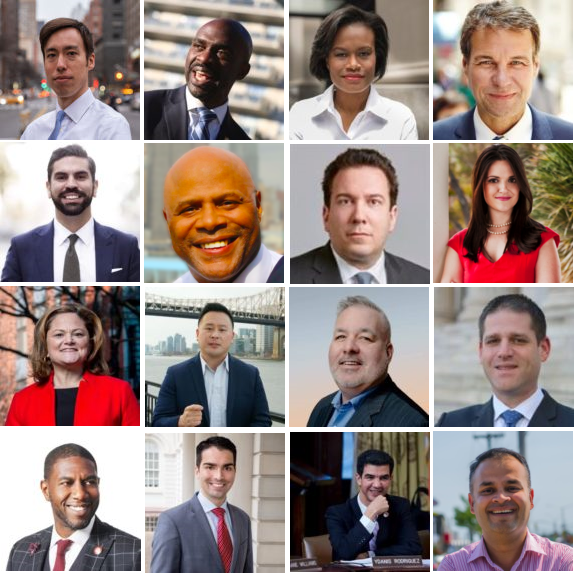 Michael Blake, Ydanis Rodriguez, Ron Kim, Danny O’Donnell and Rafael Espinal are local officeholders who saw an opportunity to step up in class, took it, and fell short. Their numbers might be disappointing or gratifying to each individual, but they probably don’t mortally wound anyone’s hopes of higher office given the weird timing and size of the race. Dawn Smalls, Nomiki Konst and Benjamin Yee are new candidates on the New York scene who ran dark-horse campaigns that fell short but ensure that a lot more people know their name than did before, should they plan on running for something else. Jared Rich, Eisenbach, Helal Sheikh, Manny Alicandro and Tony Herbert were long-shot candidates chasing a dream with little money—they’re no less relevant today than they were before. Only Williams and Melissa Mark-Viverito stood to suffer significant damage from a loss because they’re already citywide names touted for citywide office. After having lost his bid for Council speaker and his underdog campaign for lieutenant governor, Williams would have been hurt badly by a defeat. As a former Council speaker who would have instantly become a putative 2021 mayoral candidate had she won, Mark-Viverito had somewhat less skin in the game than Williams, but still walks away with a bruise or two. Not fatal, but not the optimal outcome for her or her loyal supporters. 4) Public financing didn’t create a single “level playing field.” It actually created two. One consisted of candidates who each had enough dough to run a credible race, even though some had a lot more taxpayer cash to work with than others: Williams got nearly three times the public financing that Mark-Viverito received. The other field consisted of the long-shot candidates—Manny Alicandro, David Eisenbach, Jared Rich, Helal Sheikh and Tony Herbert—who didn’t qualify for public financing at all. That bifurcation is no different from any election that has occurred since 1989 under the city’s matching-funds system. What was different this time was the new eight-to-one matching ratio, which Williams’ campaign used masterfully, parlaying $267,000 in private contributions into $1.1 million in matching funds. That made for a very expensive little election: at least $7.2 million in public funds and $2.6 million in private contributions, which—because of the low turnout—translated to a hefty total of $24 per vote cast. By comparison, in the 2017 public advocate primary and general elections, looking at the total amount of spending and the total number of votes broke out to about $1.20 per vote. A special election is not a valid test for any campaign financing scheme. But as the 2019 Charter Revision Commission looks at ways to strengthen democracy in the city—including so-called democracy vouchers—it’s worth asking whether a higher matching-funds ratio is enough to get us there. 5) This special election mechanism is imperfect, but what would be better? If this were a normal election, we’d have woken up this morning to the news that there’d be a Democratic runoff between Williams and Mark-Viverito, with the winner facing Ulrich in the general election to follow. Of course, that would have meant the possibility of as many as seven elections for public advocate this year, but it would have resulted in the winner for the special election for public advocate actually getting a majority, or at least a stronger plurality, of votes. Again, Williams’ capturing a third of the ballots in such a crowded field is nothing to sneeze at, but would Tuesday’s result feel like a sufficient reflection of the will of the people if this had been a special election for, say, mayor, which would have been played by the same rules? Fact is, off-cycle elections are always going to be clunky. That’s why it’s handy when people serve out the terms to which voters have elected them. 6) Democrats have to figure out how to be consistent about the topics of gender and criminal justice—even when they both come up at once. In the last stages of this race, there came the release of a sealed record of Williams’ arrest after a 2009 domestic disturbance. The allegations were deeply troubling, but so was the way we learned about them. There’s a lengthy history of people having their careers harmed by the surfacing of arrests that never resulted in prosecutions (where the person could challenge the evidence against them), let alone convictions. The broadening critique of the criminal-justice system—too many arrests, a racial skew to who gets arrested—serves only to highlight the problems created when sealed arrests of many years ago are thrown into the spotlight, even when those arrests involve issues of domestic violence or sexual abuse. No candidate seemed willing to make that nuanced point. For his part, Williams’ explanation of the incident seemed to evolve under questioning. As a person seeking high political office, he deserved greater scrutiny than a typical job candidate—and, recognizing the long-overdue attention that gender-related violence is now receiving, should have said a lot more and a lot sooner. 7) De Blasio’s second term just got harder. From voting against the mayor’s mandatory inclusionary housing scheme to pushing for criminal justice reforms that City Hall resisted, Williams has been a thorn in de Blasio’s side as Councilmember. Now Williams has a citywide perch from which to prosecute his case against the mayor’s brand of establishment progressivism. Almost all the candidates in the special election would have pursued an adversarial approach to the mayor because that’s the flavor du jour, but Williams has two things most of the others don’t: a loyal citywide following born of the lieutenant governor campaign and an ability to command media attention, both key elements in enhancing the advocate’s limited powers. 8) New York’s gender gap just got wider. The 2017 elections saw a major loss of City Council representation by women. Now, the one citywide post that had been held by a woman (Tish James) will be held by a man, like the other three citywide offices of mayor, comptroller and Council speaker. And Mark-Viverito, the only woman who seems remotely part of the 2021 mayoral picture (along with Comptroller Scott Stringer, Speaker Corey Johnson, and Borough Presidents Eric Adams and Ruben Diaz, Jr.) suffered a setback last night and, as of now at least, will have no elected office from which to mount such a run. Mark-Viverito’s concession speech urging young women to run for office echoed what Ruth Messinger said in defeat 22 years ago. In the “year of the woman,” New York seems no closer to electing a female mayor than it was a generation ago. That’s a problem. 9) Is Eric Ulrich the Great Republican Hope? The Queens Councilmember ran a strong race and posted a strong finish. Queens County GOP Chair Joann Ariola told QNS, “Eric made everyone in this state feel that the Republican Party was validated, we’re redeemed and we can win races. A Republican in a field of Democrats who had great name recognition can compete.” Well, maybe. It is significant that Ulrich beat out the better-known Mark-Viverito and the better-funded Blake. In a city where registered Republicans comprise a mere 10 percent of voters and are at a nearly 7:1 disadvantage to Democrats, his 19 percent showing was solid. However, he was the only establishment Republican in the race, the most anti-de Blasio candidate in a city where the mayor has middling popularity, the most pro-Amazon candidate in a town roiled by the HQ2 collapse, and the recipient of the Daily News and Post endorsements. Plus, in 2021, Republicans won’t have the easy target of de Blasio to kick around anymore. It’s clear that Ulrich is well positioned compared to other potential GOP hopefuls for mayor, but it is far from certain that he is someone who can really compete with Democrats citywide. But hey, it’s early. We’ve at least a few months to the next election for public advocate. By then we might have another nine points to make. Or at least enough to make an even 10. The WBAI hosts break down the results from the special election for public advocate and speak to winner Jumaane Williams about his victory and his next steps. Max & Murphy: Bill de Blasio … Presidential Candidate? Go ahead and diss Hizzoner’s apparent flirtation with a run for the highest office in the land. Just do it for the right reasons.